This work brings together the pivotal, scholarly essays responsible for the present resurgence in rhetorical studies. Assembled by one of the most respected senior scholars in the field of rhetoric, the essays chart a course from tradition-based theory of civic rhetoric to ongoing issues of figuration, power, and gender. Together with a lucid introductory essay, these studies help to integrate the still-volatile questions at the core of humanities scholarship in rhetoric. The introductory student as well as the seasoned scholar will gain familiarity and footing in this oldest--and still new--liberal art. Contents: T.B. Farrell, By Way of Introduction. L.F. Bitzer, Political Rhetoric (1981). K.K. Campbell, The Ontological Foundations of Rhetorical Theory (1970). R. McKeon, Creativity and the Commonplace (1973). M.C. Leff, In Search of Ariadne's Thread: A Review of the Recent Literature on Rhetorical Theory (1978). M.J. Hyde, C.R. Smith, Hemeneutics and Rhetoric: A Seen, but Unobserved Relationship (1979). M.C. McGee, The "Ideograph": A Link Between Rhetoric and Ideology (1980). T.S. Frentz, Rhetorical Conversation, Time, and Moral Action (1985). C.R. Miller, Genre as Social Action (1984). J.R. Cox, The Die Is Cast: Topical and Ontological Dimensions of the Locus of the Irreparable (1982). D.P. Gaonkar, Rhetoric and Its Double: Reflections on the Rhetorical Turn in the Human Sciences (1990). C. Blair, Contested Histories of Rhetoric: The Politics of Preservation, Progress, and Change (1992). 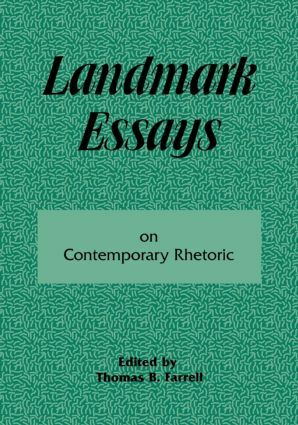 Landmark Essays is a series of anthologies providing ready access to key rhetorical studies in a wide variety of fields. The classic articles and chapters that are fundamental to every subject are often the most difficult to obtain, and almost impossible to find arranged together for research or for classroom use. This series solves that problem. Each book encompasses a dozen or more of the most significant published studies in a particular field, and includes an index and bibliography for further study.